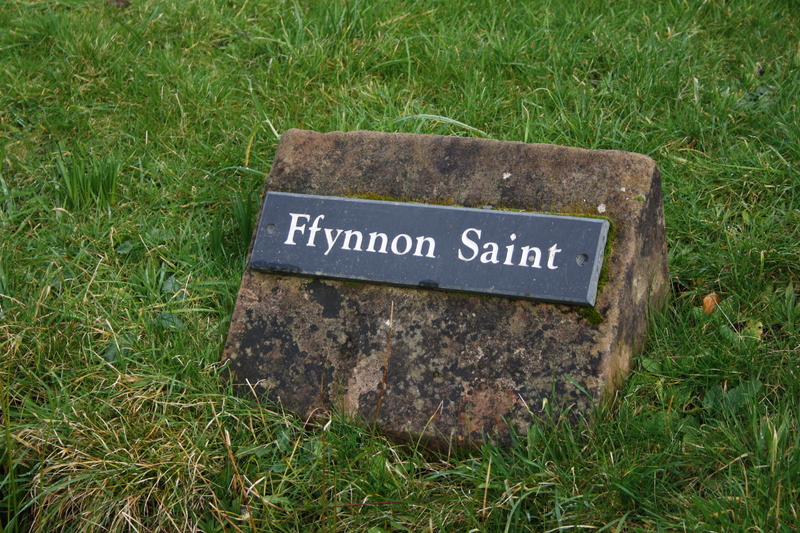 For a well with so little remaining substance or recent history, Ffynnon Saint in Criccieth is remarkably well signposted. It lies (lay) at one end of Holywell Terrace and the spot is more emphatically marked by a slab of slate, upon which its name is recorded. 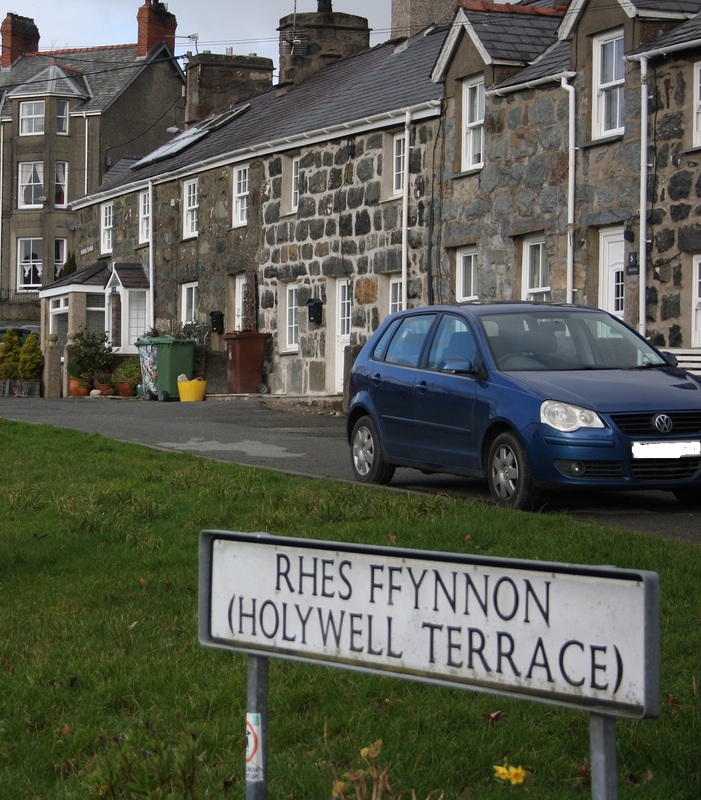 Holywell Terrace is set back across a grassed area beside the B4411 as it leaves Criccieth towards the north. Although there is nothing to see of the structure on the ground, the well appears not to have completely vanished. 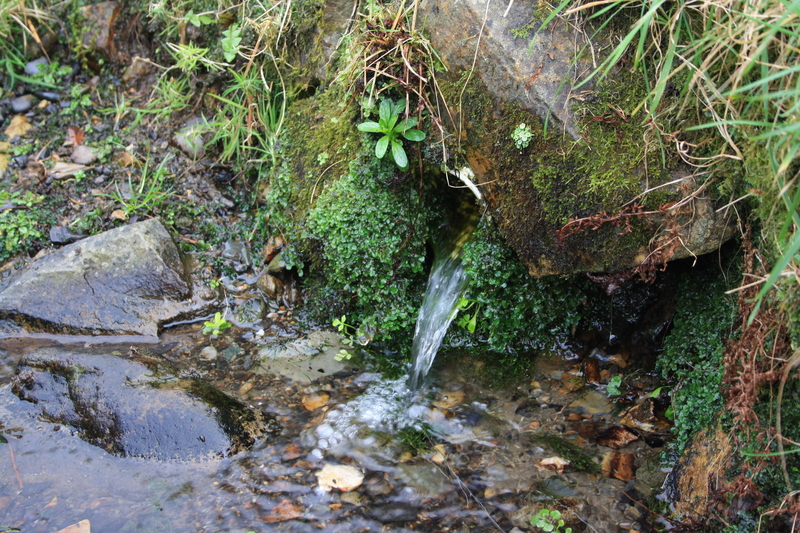 A fast flowing stream runs in a channel in front of the terrace, and close to the point where the well should have been a piped flow of water joins the stream. 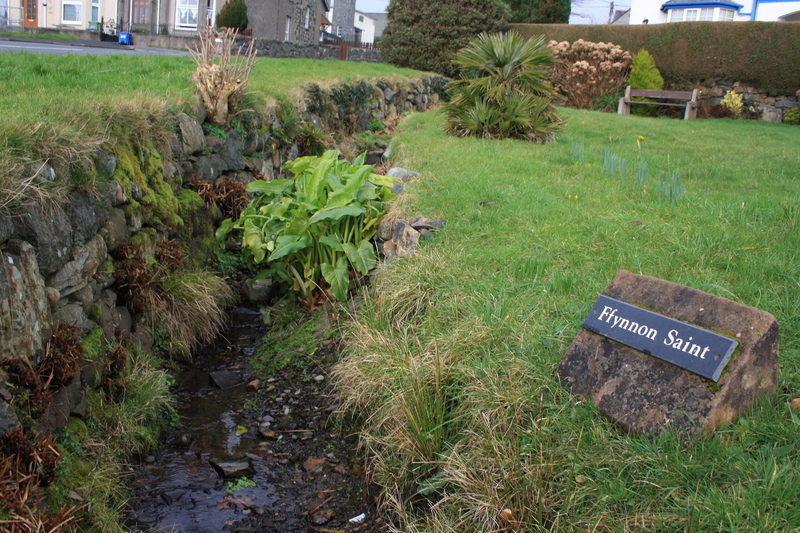 I have been informed that this is indeed coming from the spring and is one of three pipes that carry the spring water into the stream, it is good to know that despite all the changes Ffynnon Saint is still down there somewhere. (Again many thanks to a local correspondent for providing information on the well). While the signs help to retain a vestige of the spring in public memory, it is clear that the substance and the traditions have been long gone. Fardd writing at the start of the 20th century notes that it was already lost. He records that the well lay in the corner of a field sloping down from the church. Holywell Terrace appears in the 1889 OS maps, and even by then the field system appears to be breaking down being replaced by building. Fardd notes that formerly it was the custom for local people to visit the well on Easter Sunday and to throw either keys or pins into the well to secure the patronage of the Saint, presumably Saint Catherine. The well was also noted as a resort for the cure of eye complaints. St Catherine’s church la hundred yards or so to the east of the well. It would seem that there were once clear paths between church and well, although now the route between the two is a little more convoluted. Around 1962 the well finally vanished from view when it was filled in so that a garage could be built on the site, and we thus effectively lost another holy well. A little coincidence that both this well and St Beuno’s well mentioned in the previous report seem possibly (according to some accounts at least) to have been lost to the requirements of the car. Myrddin Fardd (1906) Llen Gwerin Sir Gaernarfon. Royal Commission on Historic and Ancient Monuments in Wales. (1960) Central Caernarfonshire. Oh well, at least there is the little marker and all the place names! Well over time and actually each moment the world is fluid isn’t it? Things come and go, weave, wander, and fall off (including the art of real ginger beer). Waterways ruled us once and we have come to dominate nature (to a degree) for an easier existence, or so we think. What springs to mind is that before this spring became a well it had an existence too, all on its own…which merits some thought given wildlife, birds, sunlight, trees, bacteria, green algae, and maybe even sprites (or is that spelled spirits). I like indoor plumbing and tap water on demand. When I have filled buckets for the kettle or other matters I haven’t appreciated or thought too deeply about water other than it is heavy to carry. It weighs a lot. I wonder how and why it was a holy well? Is this a chicken and egg situation? Was a place of worship there first and then the water made holy or the other way around? It is profound to think how the well has quickly been forgotten. The blatant sign is ignored and has no meaning. Think of those miles of footsteps back and forth as the solitary inhabitant then multiplied. And one day it just stopped forever and was never thought about again (website excluded). Following the Reformation, when so many of the direct religious associations with wells were banned, each well then survived or failed on its merits. Many continued to be visited, and folk customs within communities may well be corruptions of earlier traditions. At the same time new uses were found – many wells were caught up in the craze for outdoor bathing and the health associations with that, with spas, while others, providing a steady water supply were adopted for farming, tapped for household supply or used in industry.